DeZURIK V-Port Ball Valves are quarter-turn control ball valves for accurate throttling control of fibrous suspension applications plus clean, dirty viscous, and corrosives liquids and gases. They are designed to meet the highest industry standards for dynamic performance. Flanged or flangeless designs meet ANSI or ISA face-to-face dimensions. 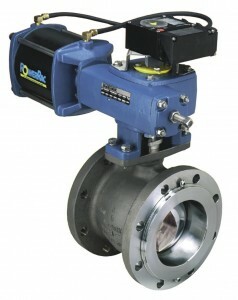 V-Port Ball Valve design features include blow-out proof shaft protection, high flow capacity, splined ball-to-shaft connection for ease of maintenance and zero backlash. Seat options include flexible metal, rigid metal and PTFE seats.